As part of The Outer Banks Hospital Development Council’s annual gala, tickets for an exciting raffle are now on sale. For $20 per ticket, raffle participants will be entered to win a backyard makeover, which includes a Wilmington Grill, Yeti cooler and tumbler set, pub set with two pub chairs and pub table, and an Adirondack set that includes two chairs and a side table. The hospital partnered with Kellogg Supply Company, who also serves as a sponsor of the annual gala, to secure the raffle prizes. Valued at $3,600, the package winner will be selected at The Outer Banks Hospital Gala on Saturday, Feb. 9, 2019, presented by TowneBank OBX. The winner does not need to be present to win and will have the opportunity to select the colors for both the pub and Adirondack sets. Raffle tickets can be purchased at Kellogg Supply and Cottage Shop locations in Manteo, Nags Head, Kill Devil Hills, and Duck. Tickets can also be purchased by visiting the information desk in the lobby of The Outer Banks Hospital between 9am and 3pm, Monday through Friday. 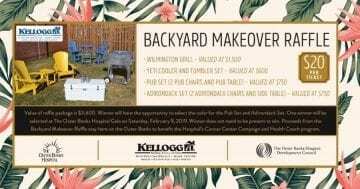 Only 500 tickets will be sold and all proceeds from the Backyard Makeover Raffle will benefit the hospital’s Cancer and Health Coach programs. To purchase your raffle tickets or learn more about the Development Council’s annual gala, please call 252.449.9183.